Come join us at Adventure Mountain Snow Park as fall is setting in in the Sierras for an adventure to Echo Summit. While some sections are technical and tough, with very steep, rocky terrain, all sections are very runnable. This is an extremely rewarding and challenging course with 75% single track, 20% dirt road, and 5% pavement. This event held under special use permit with the Eldorado National Forest. Active military receive a 15% discount. Entry fees are non-refundable unless the event is cancelled. Pre-registered runners may purchase a T-shirt for an additional $20.00 10 days before the race. 6:00 AM: Parking lot opens. 6:30 AM: Runner check-in. Race day registration available. 7:50 AM: Trail briefing at the start/finish. 8:00 AM: Start all distances. On Friday we will be at the Strawberry Lodge for early check-in. There will be a Friday trail briefing from 5:30 PM to 7:00 PM. The course will be marked with ribbons, which will be connected to clothespins on bushes, trees, etc. Keep your head up looking for ribbons. Signs including distances and direction arrows; 8×11 signs connected to 3ft wooden stakes on the side of the trail. BLUE RIBBONS: We will run the 5K course twice, returning to the finish twice. An aid station will be provided on the course and at the start finish. PINK RIBBONS: This is out and back with turnaround at the first aid station. PINK RIBBONS: This is out and back/turnaround beyond/passed the 2nd aid station on Bryan dirt road approximately 1/4M to the wooden bridge cross over the bridge then turn around and return to the finish the exact way they came. 10M/Bryan Loop: ORANGE RIBBONS and Signs. 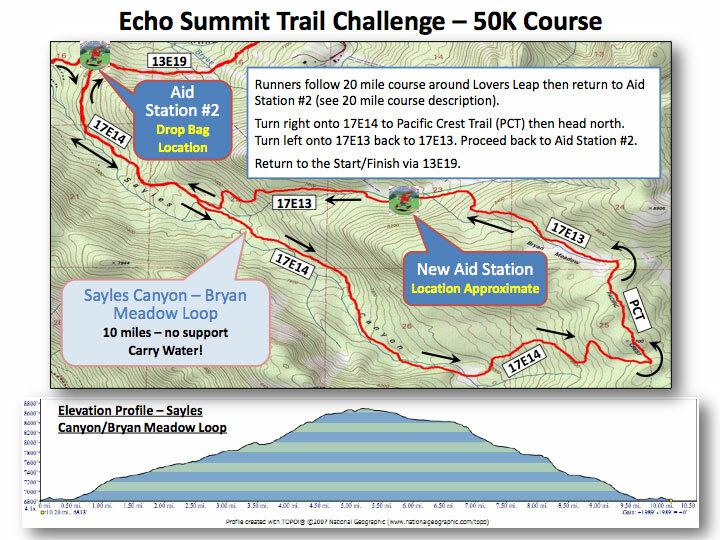 The runners will do this loop after leaving the 2nd aid station the 2nd time out. Counter clockwise loop. First loop follow 50K signs/counterclockwise loop. Later on in the event and the 2nd time doing this loop the runners will do a clockwise loop. Drop bags for 50K and 20M runners will be picked up the morning of the race at the start. One drop bag location Aid Station 2 Bryan Road. Drop bags will be returned during the day and at the end of the race to the start/finish. Race Central is at Strawberry Lodge, Kyburz, CA and the race starts at the Lake Tahoe Winter Experience Parking lot located here. We will be at the Strawberry Lodge at 5:00 pm in the banquet room for runner check in registration, trail briefing & dinner at 6:30 pm. Lodging is available. 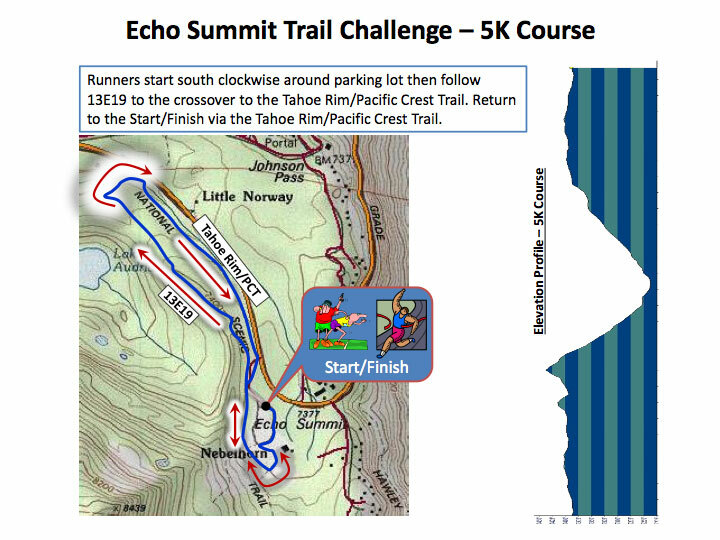 Important info the START/FINISH is a 15 minute drive EAST up Hwy 50 to Adventure Mtn Lake Tahoe/Snow Park. A $5 parking fee will be charged. From Strawberry Lodge or Lovers Leap Campground take Highway 50 East approximately 15 minutes, 8.4 miles East from Strawberry Lodge. At Echo Summit turn right, into Adventure Mountain Snow Park parking lot. The event starts/finishes from the parking lot. Find the signs for Pacific Crest Trail, Tahoe Rim Trail. If you are coming from the “Sierra at Tahoe” ski reort, take “Sierra at Tahoe” Rd to Hwy 50, turn right continue to drive East 2.8 miles to the Adventure Mountain Snow Park aka (Lake Tahoe Winter Experience) parking lot. Find Start & Finish area. For travel on Highway 50 West, drive until reaching Echo Summit. Turn left into Adventure Mountain Snow Park aka (Lake Tahoe Winter Experience) parking lot, find the signs for Pacific Crest Trail, Tahoe Rim Trail. Event starts from the parking lot. Carpooling is encouraged. There is a $5 parking fee per car. Please have exact change. Overnight RV parking is available for a fee of $10 per car. Please make reservations ASAP prior to the event. No RV hookups but, there are bathrooms available that night. The parking lot opens at 4:30 am. All trail workers need to inform me of their plan to come and where we are to meet. If you cannot make it for any reason please let me know asap. Trail workers need to bring their own rake and supplies for the day. Contact me at (530) 409-2989. Caples Creek Trail Head 8:00 am start at Silverfork Road. I will be at Hwy 50 and Silverfork Road at 7:15 am and will leave at 7:30 to Caples Creek TH. There will be no off road driving except parking on a dirt road and parking lot. I will make myself available to meet anyone at the Safeway in Pollock Pines on Sly Park Road and Pony Express at 6:20 am. We will leave at 6:30 am. Please call to let me know that you are coming or want to meet at the locations listed. Bathrooms are available at Silverfork Campground just before the Caples Creek Trail Head. Please let me know if we need to stop there on the way out. Depending on the number of workers will depend on what I will assign groups. Bryan Meadow Loop, Lovers Leap Mtn, Pony Express Trail between Sierra at Tahoe Road and Echo Summit. We will meet at the Strawberry Lodge on Hwy 50 at 7:15 am and will leave at 7:30 am. Anyone coming from Sacramento if needed, I will make myself available to meet at the Safeway in Pollock Pines CA on Sly Park Road and Pony Express Trail at 6:20 am will leave at 6:30 am. Results will be posted here after the event. Please be aware that many types of wildlife live in the Sierras. Please keep your eyes open at all times & be aware of your surroundings. Look for the circular expanding rash, sometimes looking like a bulls-eye, which occurs 2-10 days after a tick bite with lyme infection. The heat is already here! Check out our Summer in the Sierras races for a high-elevation (read: cooler) option this summer. TCTRuns.com for more info/registration. A great day for the rolling hills of Rancho San Vicente! Thank you, runners!